Les Aviateurs de la Grande Semaine d'Aviation de Rouen 19-26 Juin 1910. 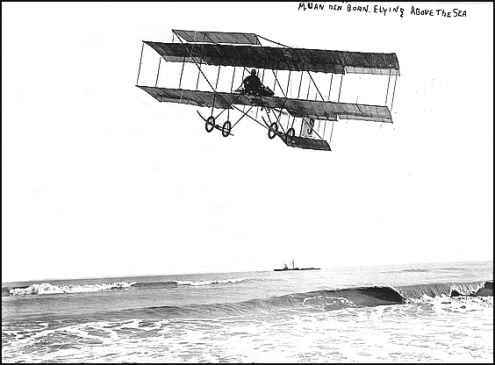 21 L'Aviateur VAN DEN BORN en poste de Direction d'un biplan H. Farman. 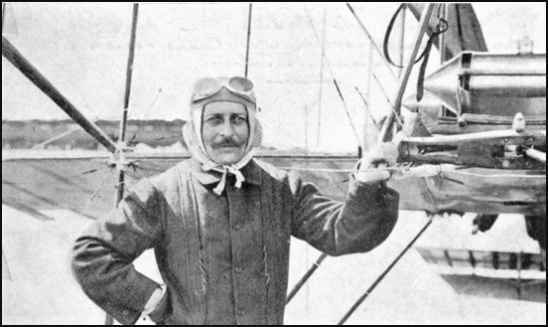 Van Den Born was one of the earliest licensed pilots. Born 11 July 1874 (some sources say 1873) in Liege Belgium, He died on 24 Jan 1958 in Saint-Germaine-en-Laye (Yvelines, France). Though born in Belgium, his mother was French, and he later became French. 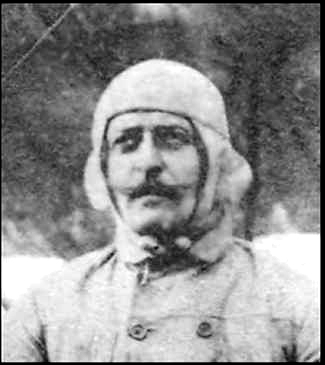 Before taking up flying, he was well-known as a bicycle racer and automobile racer. 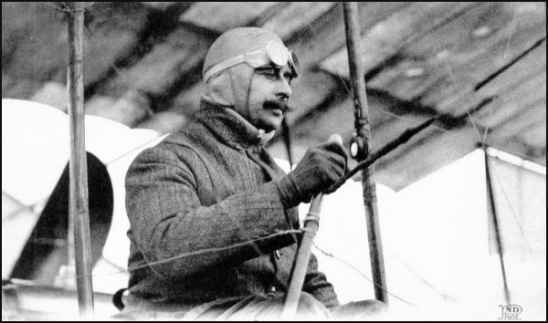 He earned his French pilot's license on 8 March 1910 (#37) in an H. Farman, and his Belgian license on 31 March 1910 (#6). 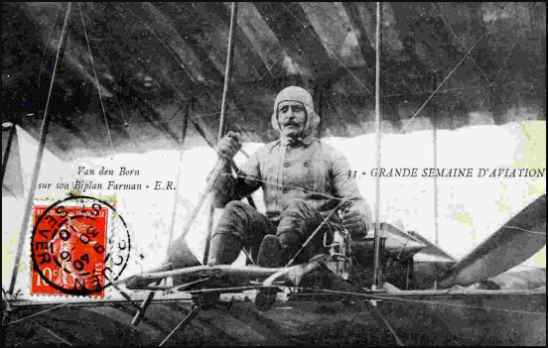 His flying career included flight demonstrations in Italy, at Nice, in French Indochina, and then in Thailand and China. He was the first to fly in French Indochina (Vietnam), Hong Kong, and Thailand. During WWI he directed the Belgian aviation school in France, and then later returned to Indochina. He returned to France after the Indochina Wars. ONLINE RESOURCES If you search for Charles Van den Born using Google, (7-27-07), you will find about 312 links. Among the most helpful are the following. However, you will be rewarded by visiting some of the other links as time permits. The Pioneers This website offers a resumé of the history of aviation in Belgium from 1794 to 1996. Included in the story is the following paragraph which mentions Charles Van den Born. "In 1910, the Aero-Club of Belgium organised a flying week in Brussels at the Stokkel Hippodrome. Eleven Belgian pilots were listed on the program :Pierre de Caters, Jan Olieslagers, Charles Van den Born, Joseph Christiaens, Jules Tyck, Jules de Laminne, Nicolas Kinet, Alphonse de Ridder, Leon Verstraeten, Joseph d'Hespel. and Alfred Lanser. Olieslagers established a new world record flying at a height of 1,524 metres." by John Wagstaff. One of the most comprehensive, interesting and surprising is to be found on this website. It recounts the story of Charles Van den Born, who made the first powered flight in Hong Kong in a 1910 Farman bi-plane, on the afternoon of March 18, 1911. In addition, it tells the story of the flight of a replica Farman flown by Roger Freeman on November 18, 1997 and includes three large photographs of his plane. To access the site, just click on the title above. Tom Claytor An important and fascinating supplementary story may be found on this website. "Miss Siam" is an OX-5 Travel Air 2000, and was the first private aircraft in Thailand. In 1932, Mr. Luen Pongsobhon flew this aircraft solo from Thailand to China. His flight was repeated on the 70th anniversary of the flight in November, 2002. There is an extensive collection of stories and photographs of this event and I think you will enjoy your visit to the site. In addition, I recommend that you visit Tom Claytor's website by clicking on his name, You will be treated to a fascinating story of his adventurous life as a world-traveling "Bush Pilot." To access the site, just click on the title above.